Tour the restored World War II submarine, USS Bowfin (SS-287). 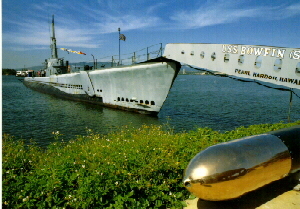 Located adjacent to the history of submarines museum, and next to the Arizona Memorial Visitor Center. The mini theater presents the film “Silent Service”. Adults and children age 5 and older can tour the USS Bowfin. This is a spectacular waterfront Memorial to get a great sense of history. Take time to honor those who made the ultimate sacrifice to their country that fateful Sunday morning, December 7, 1941. The USS Arizona Memorial is a spectacular and beautiful memorial to those Sailors and Marines who were killed on board. You will gain and appreciate the history by first viewing a documentory film about the USS Arizona & WW II. Then after the film, you will board a shttle that will take you directly to the Memorial. Once at the Memorial, you will have time to view the marble wall with the 1,177 names of those who were killed on the Battleship USS Arizona. The Memorial spans the sunken hull of the Arizona, at low tide the gun turrets are above the water line, and you can see the oil still seeping from the ship, which is an eary reminder of the devastation that occured. 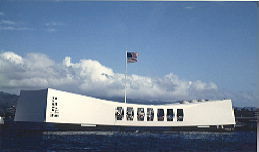 Visitors at the Memorial are welcome to place flowers or leis at the wall of names, or throw the flowers or leis in to the water in rememberance of those who gave their lives for their country. Admission to the USS Arizona Memorial Visitors Center is FREE, but(free)tickets for the documentary & shuttle to the Memorial are required, first come, first serve. Give yourself about 1.5 - 2.0 hrs. to take in the Memorial and Visitors Center. Visit this,unfairly overlooked, memorial to the USS Utah, that was also sunk on December 7, 1941. Over one million visitors each year visit the USS Arizona, but few visit or even know that the USS Utah lies on her side on the Western side of Ford Island, almost directly across from the USS Arizona. In the past it was easy for the USS Utah to be over shadowed by the Uss Arizona, but now with the bridge for Oahu to Ford Island complete, the Memorial for the USS Utah is much easier to access. The USS Utah lost 6 Officers and 52 Enlisted men, of the ships 431 assigned crew, some of which are still entombed on the USS Utah. Please come and pay your respects to those who gave their lives. More commonly known as "Punchbowl", the cemetary overloolks Honolulu and has a wonderful view of the ocean. The Punchbowl cemetary is located in the crater of an extinct volcano. The name of the exticnt volcano is "Hill of Sacrifice" which is a fitting name because the cemetary has over 25,000 graves of men & women who served and died in WW II, Korea and Vietnam. This is the Arlington of the Pacific and is a must see. View the beautiful 30 foot statue that overlooks the cemetary, stroll through the chapel and galleries dedicated to those who served. Take the paved road that leads from the cemetary to a lookout which ofers specatacular views of Diamond Head, Waikiki, Honolulu & the Honolulu Airport. The lookout point is with in walking distance from the cemetary. If your a Military buff, this is a great place to have a look. The museum is small, but it has much to see from early Hawaiian army to the Vietnam War. The exhibits are well presented and keeps your intrest. It's located in Waikiki in an old coastal defense battery, in Fort DeRussy Park, next to the Hale Koa Military Hotel. It's only a short walk from anywhere in town, take the time to visit!! The Iolani Palace is the ONLY Royal residence in the United States and was used by the last ruling Hawaii monarchs, King Kalakaua & Queen Lili'uokalani. The Palace can be seen in 45 minute tours, starting every 15 minutes. It's reccommended to make reservations, due high demand. This was once the summer residence of the Queen Consort of King Kamehameha IV. The Palace was built in 1848 in the Nuuanu Valley, just outside downtown Honolulu. Come visit the royal retreat for Queen Emma. The home is full of Hawaiian historic artifacts,royal memorabilia and paintings of Hawaii's Kings and Queens. The property grounds are immaculate, amust see!!! Located in down town Honolulu, on S. King Street, directly across from the Iolani Palace. Visit the statue dedicated to the Great King Kamehameha, who united all of the Hawaiian Islands. Behind the King Kamehameha statue is the Ali'iolani Hale, the State Supreme Court Building. Take a look around at the building's stunning architecture!! Located in the Ali'iolani Hale, State Supreme Court Building. It's mission is to help educate the public of Hawaii's legal history and its judicial system development, by being the brigde of communication between the Judiciary system and the community. The Center exhibits, displays & explains information from the past two hundred years of legal documentation. There are many exhibits depicting critcal legal events in Hawaiian history that helped shepe the Hawaii that we know today. Located in down town Honolulu, on the corner of S. King Street & Punchbowl Street, 1/2 block from the King Kamehameha Statue & Iolani Palace. This church is built out of coral blocks, and helped the missionaries in the late eighteenth & early nineteenth century, bring Christianity to Oahu. The church opened in 1842, after five long years of construction, built from approx. 14,000 coral blocks, each weighing 1,000 lbs. Also be sure to see King Lunalilo's Tumb, which is located at the entrance to the church. The church is open to the public on sundays for 8:00 A.M. & 10:00 A.M. services. The 10:00 A.M. service prayers are recited in native Hawaiian. This National Historic Landmark is located in down town Honolulu, on the corner of S King Street & Kawaiahao Street, 1 block from the Kawaiahao Church. Take a step back in time to early nineteenth century Hawaii. 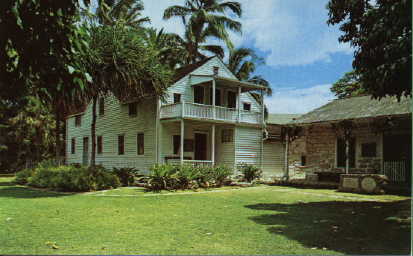 Explore the Visitors Center and the Chamberlain House at your leisure, their are tours through out the day of the oldest Frame House in Hawaii and the Printing Office. There are numerous ongoing historical events such as living history, Hawaiian Quilting Classes, Historic Downtown Walking Tours and so much more!!! There's also a Museum Shop and Museum Library availible. Open Tuesday - Saturday 9:00 A.M. - 4:00 P.M., Adults: $6.00; Seniors, Military, Kama'aina: $5.00; College Student W/ID & Young Adults(13-18): $3.00; Children (4-12): $2.00; Children 3 & under are FREE. Located on the Windward side of Oahu, just off Kahekili Highway in Kaneohe. The Byodo-in Temple is modeled after the famous 900 year old Buddhist in Japan. It was built in 1968 in honor of Japanese immigrants who came to Hawaii in the late 1800's to start a new life. The facility also bosts a two acre reflecting pond with thousands of beautiful Koi. The temple has a giant 9 foot gold Buddha with a brass bell weighing 3 tons. This Japanese religious monument is truely a wonderful and tranquil sight to visit. The Nuuanu Pali lookout provides you with one of the best views of the windward coast of Oahu. The view from the Pali extends North from Kualoa, center are Kaneoha Bay & Kailua, and pans as far South as Waimanalo. Truely one of the most picturesque spots on Oahu. Beware of the Hawaiian legend of cars stalling on the Pali while carrying pork. It happens, I never go against Hawaiian legend, but my friends have and their car stalled while crossing the Pali with pork. Respect Hawaiian culture & tradition!!! Haleiwa is located on the World Famous North Shore of Oahu, and remains as a symbol of the old Hawaii. The town started as a plantaion town, but as the waves of the North Shore gained in popularity, it quickly became a surfing community, now it's a major attraction. Haleiwa is the best place to try local eats like shave ice, local fruits such as mango's. The town is full of craft shops and art galleries that specialize in the "Aloha Spirit". The major landmark for Haleiwa is the Anahalu River Bridge, better known as the Haleiwa Bridge, which serves as a symbol of the North Shore. Just bejond the Haleiwa bridge is the Haleiwa Beach park. Don't forget to take time to visit the Surf Museum in the North Shore Marketplace. Located on the Windward side just beyond Hanauma Bay, the islands of Molokai and Lanai can be easily seen across the channel on clear days. The Blowhole, "Oahu's Old Faithful", is a lava tube that channels the sea swells. As the swells come in, the water enters the tube at its opening underwater and is forced out of the top of the tube creating a geiser effect. Lei Aloha Center, a non-profit organization dedicated to discover and document the mysterious and far reaching effects of dolphin sonar and its extraordinary healing benefits on both children and adults challanged by Neurological Disorders, Autism, Muscular Paralysis, Severe Depression, Down Syndrome, Cerebral Palsy and more. The Lei Aloha Center host many Doctors and professionals from around the world, including MD's, Neuro Educational Consultants and Dr.'s of Neuroscience visit frequently to help the Center move forward. Please take a moment to read the three cases below and what our future plans are. Dolphins and You, offers you a once in a lifetime thrill for an up-close and personal experience seeing nature at her best, as you swim with free dolphins in the warm Pacific ocean! Click here for more information on Half and Full day excursions. Located at Honolulu Harbor, the famous Hawaiian landmark, Aloha Tower. Waterfront shops, restaurants, food courts and multiculural entertainment. A great to take the family and relax, get a bite to eat and do some shopping. The Waikiki Aquarium displays nearly 350 species of marine life from around Hawaii and the Pacific. Examples exhibits; sharks, nautilus, corals, sea turtles, octopus, monk seal habitat and interactive exhibits. A gift shop is also located in the Aquarium. Rates: Adults $6.00, Juniors 13-17 $2.50, Children 12 & under are free, Seniors, Local residents, College Students W/ ID, & Military, $4.00. Group rates are availible. Hawaiian Railroad "The Only Active Railroad On Oahu"
Come visit and ride the last remaining & operating railway, sponsored by the Hawaiian Railway Society. The Society has restored approx. 6.5 miles of track to operating condition on Oahu, from Ewa to Nanakuli, and is activly seeking to restore even more track. In the past the trains were used by the once thriving Sugar Cane industry in Hawaii, and the Military. The train ride is 1.5 narrated hours and tells of how the railroad was used by the sugar cane plantations, and points out sites of historic intrest. Thanks to the Hawaiian Railway Society, today we can learn and experience the legacy of the past. This is an excellent activity that is off the beaten path!! The site is both a State and Federal Historic Site. 2 regularly scheduled Train rides are offered on Sunday 12:30 P.M. & 2:30 P.M.. The ride lasts 1.5 hrs. Rates: Adults $8.00, Children 2-12 & Seniors 62+ $5.00, Children under the age of 2 are free, but they must be held. Located across from Makapuu Beach in Waimanalo. The park offers 4,000 sea animals in exhibits and marine shows. Sea Life Park is home tha the World's only "Wholphin", half dolphin & half false killer whale. The park also offers dolphins, penguins, sea lions, false killer whales, and a spectacular 300,000 gallon reef tank to get up close to marine life. There are also sea lion shows, dolphin shows, sea bird sanctuary, sea turtle lagoon and much more!!! Open daily year round. Admission: Adults $24.00, Children (4-12) $12.00, Children 3 & under are free. 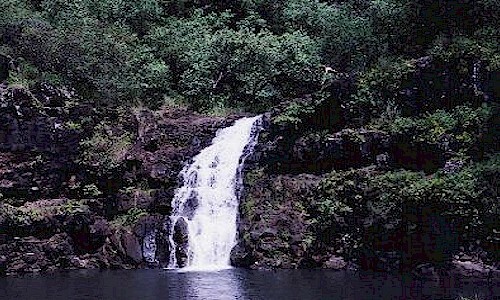 Located just a few miles North of Wahiawa, when heading to Haleiwa on the North Shore. 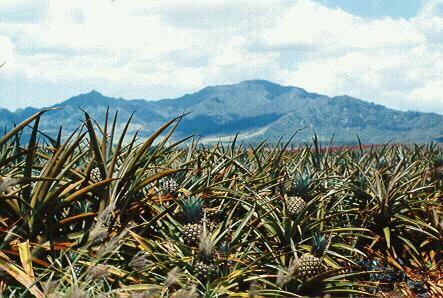 Take time on your trip to the North shore and enjoy the history of pineapples in Hawaii!! It's truly a unique expereience, with 21 varieties of pinapples from around the world to walk through in their Pineapple Variety Garden, and the historic plantation house & Dole General Store. Don't forget to take a walk through the World's Largest Pineapple Maze Garden. Located in Kapiolani Park in Waikiki near the base of Diamond Head. This outdoor music theater has nearly 2,000 fixed seats and nearly 6,000 more in the grass. This open air ampitheater is magnificent for Hawaiian outdoor concerts. The tropical breeze of the ocean mixed with the lush tropical surroundings, make for a magical experience you won't soon forget!! Be sure to take in an evening session, very romantic!!! Spectacular Hula shows are conducted in the Waikiki Shell, located in Kapiolani Park. Hawaiian history & stories are described through the beautiful and graceful ancient dance called the Hula. 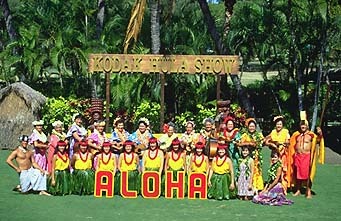 Hula shows performed 10:00 A.M. every Tuesday, wednsday & Thursday, weather permitting. Shows are approx. 1 hr. & 15 minutes. Admission is FREE. Located at the Waipahu Cultural Garden Park, 94-695 Waipahu Street, Waipahu, Hawaii 96797, Telephone 808-677-0110. Take a step back in time and see real "Old Hawaii". This outdoor museum is located on 50 acres just below the Oahu Sugar Mill. Expereince the life of a plantation worker during the early century, see how different ethnic groups and cultures came together to thrive on Hawaii's plantations. It's a historic learning experience you don't want to miss. Do something different, learn about the "Old Hawaii". Open Monday - Friday, 9 am - 3pm: Saturday, 10 am - 3pm. Escorted Villiage tours daily at the start of each hour, the last tour starts at 3pm. Admission: Adults- $5.00, Senior citizens (62+)- $4.00, Children (5-18)- $4.00. The Bishop Museum is the Smithsonian of the Pacific. The museum is world renowned for its historical, cultural & geologic exhibits of Hawaii the Pacific. The museum has the worlds largest diplay of Hawaiian historical artifacts. There's live entertainment, demonstrations of different kinds of crafts, gift shop, Planetarium and more. The observatory provides spectacular views of the universe from 1,100 ft. up in the Waianae mountains, located on the West side of Oahu. Open nightly from after twilight to 11 PM. Visitors can control telescope by computer. Rates: Adults $28.00, Children 6-17 $18.00, Children under 6 are free. Located directly across from Waimea Bay. Feel the trade winds take your stress away as you sail past turtles and dolphins, and watch the beautiful Hawaiian sunset. Come dive with turtles, eels, and tropical fish. Try diving for the first time. Dive a wreck, do a night dive, dive Turtle Haven.